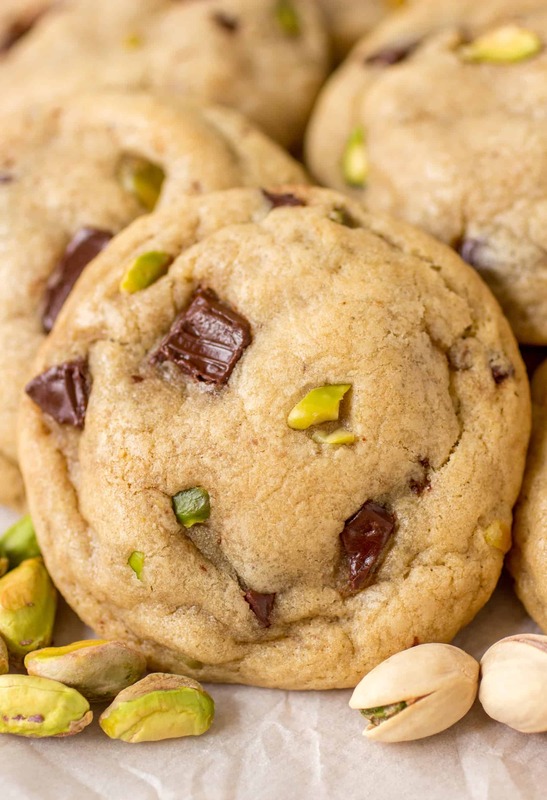 Buttery cookies filled with pistachios and melty dark chocolate! Let’s chat for a minute. Summer. How is it almost over?! It’s almost September which means back to school which means john is going back to pre-school three days a week. About that. I started him crazy late last year because he was late on potty training so he was only there for two months. Now, this year, he misses the cut off for pre-k since his birthday is in late November so he’ll have to do the preschool “grade” again. Such a bummer! But it’s actually a good thing because this rambunctious kid needs it! He’s going to be bummed not moving up with his little friends, but I think it’ll be worth it. Moving on.. Pistachios! It’s an addiction. I can probably eat an entire bag myself if nobody stopped me. Now, adding them to cookies.. that are filled with dark chocolate? Go ahead, TRY to stop me. 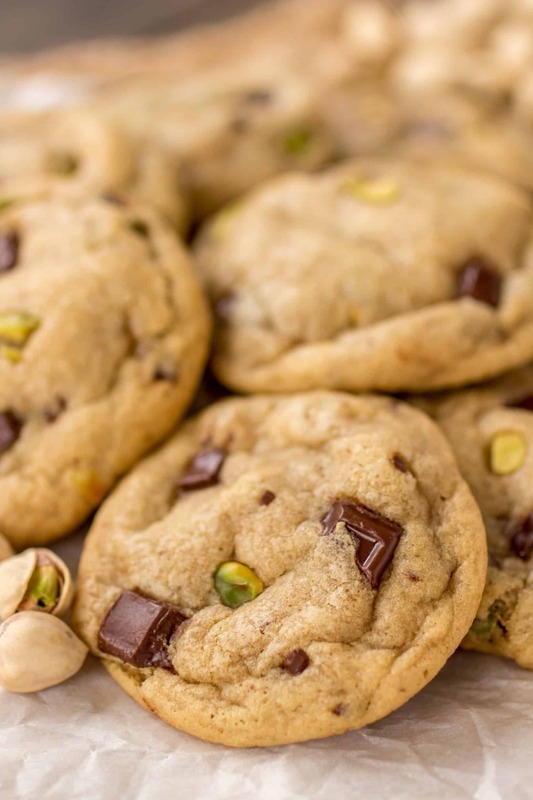 Pistachios and dark chocolate are so delicious together so when I was making these cookies, a bag of pistachios was taunting me on the counter so I decided they needed to go in the dough last minute. Best. Decision. Ever. A little tip for you guys: Buy shelled pistachios if you can. I didn’t. It took what felt like an eternity to remove the shells. So, save yourself the trouble and buy the shelled ones. The cookie recipe used here is my favorite chocolate chip cooke recipe. They’re ridiculously soft, chewy, buttery, rich.. should I go on? They’re the best. Everyone who tries them asks for the recipe. Instead of using chocolate chips, I changed it up with a bar of chopped dark chocolate. In a large bowl, mix melted butter and both sugars together until combined. Stir in the egg, egg yolk and vanilla until smooth. Add flour, corn starch, salt and baking soda and mix until just combined. Fold in chopped pistachios and dark chocolate reserving 2 tablespoons of each to press into dough before baking (optional). Do not over-mix or this can result in tough cookies. Cover bowl with plastic wrap and chill dough for 30 minutes - one hour. Preheat oven to 325 degrees. Line two cookie sheets with parchment paper or grease lightly. Shape your dough into one rounded tablespoon per each cookie and place on cookie sheet 1 1/2 inches apart. Take your reserved dark chocolate and pistachios and press them into the outside of each dough ball all over (again, optional). Bake for 10-11 minutes. Cookies will appear under-done, this is what you want if you want soft-baked cookies, they will set up just fine when they cool. If you like crispy cookies, bake them longer. Allow cookies to cool on hot pan for no longer than 5 minutes, then transfer to a wire rack carefully to finish cooling completely. 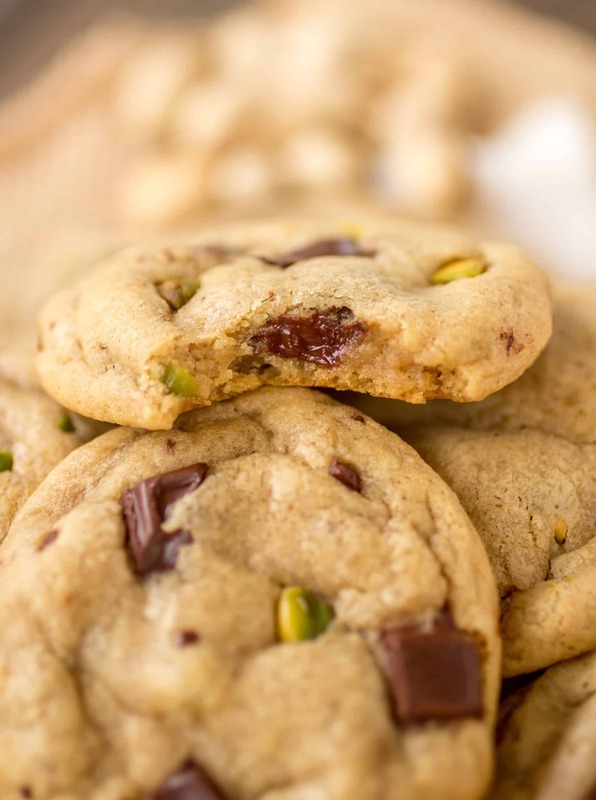 Pistachio Dark Chocolate Chunk Cookies will stay soft and fresh for up to 4 days stored in an airtight container at room temperature.